Posted on 3, March 2016 by EuropaWire PR Editors | This entry was posted in Austria, Healthcare, Technology and tagged ECR 2016, INFINIX-i Rite Edition, interventional angiography, Toshiba. Bookmark the permalink. VIENNA, 03-Mar-2016 — /EuropaWire/ — Access, speed and coverage make Toshiba’s INFINIX-i Rite Edition the right choice for interventional angiography. This groundbreaking C-arm system will be presented at ECR 2016 (European Congress for Radiology), March 2-6, in Vienna. “Our approach is simple: it’s the equipment that moves around the patient and not the other way around”, says René Degros, Business Unit Manager for X-Ray with Toshiba Medical Systems Europe. And indeed his engineering team took this simple approach to an entirely new level. Left or right side of the patient, from head to toe, C-arm over or under the patient couch: The ceiling-mounted C-arm moves around the patient giving the interventional team fast patient access while catheters stay in place. Moreover, the INFINIX-i Rite Edition is easily out of the way during a procedure. The physician can simply move the C-arm aside, thanks to its unique lateral arm movement. “Room to move translates into optimized visualization and positioning in the examination room”, Degros says about this new “3D anywhere” system as it is already being called among physicians. The INFINIX-i Rite Edition’s C-arm flips and rotates in any direction and the flat panel detector can be placed beneath the patient table. Detector and beam collimator are automatically synchronized. The image is always displayed heads up on the physician’s monitor, no matter what angulation is required for image acquisition. As interventional procedures become more complex, advanced 3D acquisition becomes a must-have. 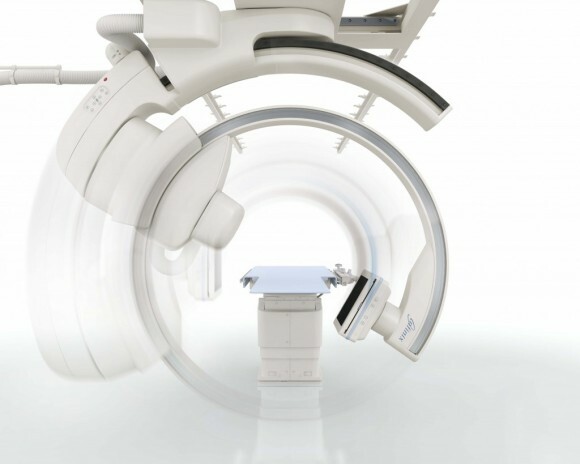 With 210 degrees, the INFINIX-i Rite Edition offers the largest anatomical coverage of any hybrid imaging suite. It rotates with an amazing speed of 80 degrees per second, doing away with motion artefacts for crisp, unmatched 3D image quality while reducing the use of contrast media. Engineering of the INFINIX-i Rite Edition began from the ground up to clear the clutter underfoot and to open the interventional room for unprecedented clinical freedom of movement by enhancing flexibility and improving workflow. Redesigned for this flagship system, the flat panel detector covers 30 cm x 40 cm providing greater diagnostic information. To improve workflow the physician can program customizable tableside controls for specific functionalities, such as movement of the table, the C-arm or auto-positioning of the C-arm. Integrated with the INFINIX-i Rite Edition is Toshiba’s DoseRite that includes a range of tools and technologies to dramatically reduce radiation exposure for interventional teams as well as patients, including Live Zoom, RiteSpot and the real-time DTS (Dose Tracking System). For more information about the INFINIX-i Rite Edition and its uses, visit Toshiba at our booth 320 in Expo X2.